It’s the summer of 1973 and 14-year-old Alan Broussard is navigating the chaotic and disillusioning course of adolescence: awakening to the joys of first love, learning the meaning of disappointment, and getting accustomed to the perpetual embarrassment caused by his parents. And this is especially the case when Alan’s father – his high school’s geekiest science teacher – becomes obsessed over what he predicts will be the astronomical event of the century: the arrival of Comet Kohoutek. As the sleepy town of Terrebonne, Louisiana, gets caught up in the comet craze, Alan is preoccupied by his telescope’s ability to grant him access into the world of the beautiful girl who moved into the house across the river. But what he comes to see most clearly is a reality that’s been hidden from him his entire life: his father’s inadequacies, his mother’s growing unhappiness, his sister’s struggle to find autonomy and his own loss of innocence amidst it all. 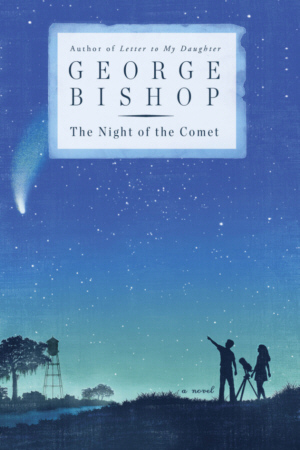 Bishop pens a delicate story about growing up – both its pains and pleasures – and the idea that hope and love can be found in the stars.